Unlike chemotherapy, a systemic treatment that travels throughout the body through the blood stream, radiation treatment is a localized treatment which is directed toward a certain site. For that reason, patients experience side effects associated with the area of the body being given the radiation treatment. 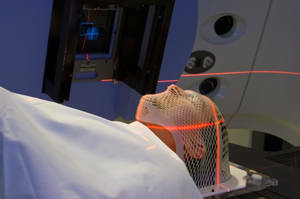 Radiotherapy, also called radiation therapy, is the treatment of cancer and other illness with ionizing radiation. Ionizing radiation deposits energy that hurts or damages cells in the area being dealt with (the target tissue) by damaging the genetic product (DNA) in the individual cells, making it difficult for them to continue to grow.